Using VirtuCrypt Plus, organizations who already own Futurex hardware can add functionality and failover to their environments. The VirtuCrypt Plus Backup service takes all of your in-house data, including encryption keys and certificate trees, and automatically replicates it within the hardened security of VirtuCrypt’s cloud. The VirtuCrypt Plus Monitoring and Alerting service allows companies to monitor their environment for system health and security, alerting administrators in the event of any critical issue. If you aren't currently using Futurex hardware, look into VirtuCrypt Enterprise or Elements service suites. VirtuCrypt Plus Monitoring and Alerting service allows companies to monitor their environment for system health and security, alerting in the event of any critical issue such as an exhaustive PIN attack or power outage. A secure connection is set up between an organization’s in-house Futurex devices and VirtuCrypt’s centralized management devices. The in-house devices function as normal, with no interference from the VirtuCrypt Plus services. VirtuCrypt Comprehensive Backup creates and maintains an exact replica of your on-site crytographic infrastructure. This mirrored infrastructure rests at VirtuCrypt’s standards-compliant, high-availability data centers where it remains safe from would-be fraudsters. Should disaster strike any of your on-site hardware, all of your critical infrastructure is preserved. For VirtuCrypt Plus Monitoring and Alerting, VirtuCrypt tracks the vital system parameters, throughput rates, error messages, and other information associated with your devices. 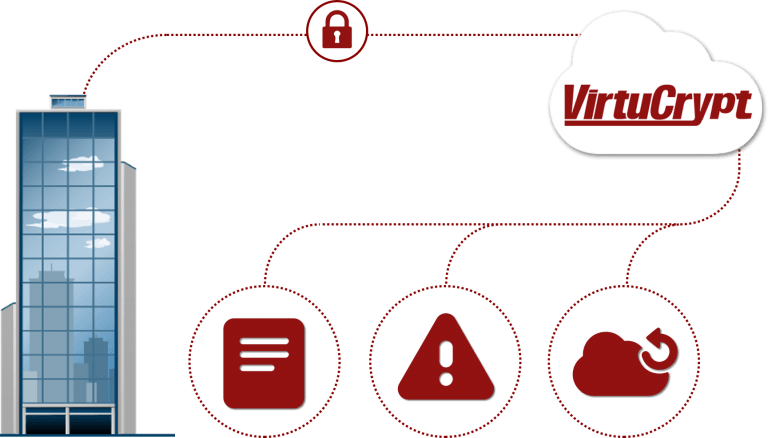 If any issues arise, VirtuCrypt will automatically notify the appropriate personnel within your organization using configurable alerting technologies such as SMS, SMTP, and SNMP.